We all want to build fast, reliable mobile apps. Facebook couldn’t make its HTML5 mobile app deliver on that goal, and decided to build its own native app. In practice, this means retiring an app that is a browser-like shell that renders web pages (a thin client), and launching a fully-fledged app on the mobile device (a thick client, with apparently a sprinkling of HTML5 inside). That’s a step backwards, and flies in the face of history. Haven’t we just been through a twenty-year evolution of thicker clients in general being replaced by thinner clients? How many apps did you install on your PC this year compared to ten years ago? How many tabs do you have open in your browser? Should Facebook have just made the web faster and more reliable? Rather than mostly abandon HTML5, why didn’t they evolve the standard and make the web better? It wouldn’t be the first time that has happened — I’m many of you remember web standards evolving in the 1990s, and you can thank those days for the better experiences we all have today. So, an opportunity lost — but I am sure the story is not over, and indeed it sounds like their new app is indeed a “hybrid app” (where there is some HTML5 inside the native app’s framework). This change also makes experimentation much harder. On the web, most major companies are running test versus control experiments or A/B tests. We put a population of users in an experiment, and compare their behaviors with those who aren’t in the test — for example, at eBay, we try out improvements to search ranking on a small population of customers and compare their behaviors to those who are seeing the regular results. The great thing about the web is you can do this fast — pretty much as fast as you can code and test the changes — and test large numbers of simultaneous variants. The outcome is you make fast progress in improving your product on behalf of your customers. Building native apps makes experimentation harder. You could build an “A” and a “B” experience into an iPhone native app, get it through Apple’s approval process, and try out the two experiences on the customers. But the barrier to entry is much higher — you can only run a couple of experiments, and you probably only release once a month at most. You’re not going to evolve your application as fast as your customers want. There are always tensions and tradeoffs: in this case it is speed and reliability on one side, and the future of the web and experimentation on the other. I would have fought hard to stay in the latter camp. This entry was posted in opinions, technology and tagged facebook, html5 on September 27, 2012 by Hugh E. Williams. My passion is fitness, and part of fueling the passion is having the right gadgets to stay motivated, work hard, and enjoy what I do. Here’s my top five (which is subject to change any year). I’m not the first to put the fitbit at the top of a list — mashable did it just two weeks ago. For $99 you get yourself a tiny, wireless pedometer. It counts daily steps accurately, measures how many flights of stairs you’ve climbed, and has a nice stopwatch. It also has a clock, a fairly useless calorie burn guesstimator, and a few other features. The stopwatch is useful for timing how long you’ve been asleep — press and hold the button on the front and the stopwatch starts, press and hold the button and it stops. If the stopwatch runs for an extended period, fitbit figures out you were asleep and records it as such. What’s most cool is the website. When you walk past the basestation that comes with your fitbit, your data is uploaded to fitbit.com. You can then inspect the data online, including step totals for the week, badges you win for hitting milestones, lifetime achievements, average sleep duration, and more. For me, there’s a healthy competition with friends I’ve connected to on fitbit: who’s did the most steps this week and where am I ranked. You get a weekly email on Tuesdays with a summary of last week’s performance. 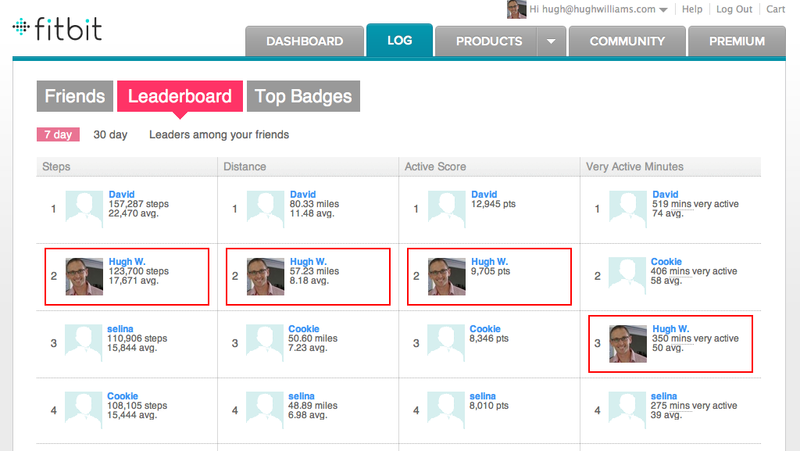 The fitbit leaderboard at the fitbit.com website. If you own a fitbit, compete with your friends. I can’t say I’m achieving my step goals every week, but I love how the fitbit motivates me to move. The TRX Suspension Trainer or TRX is a new essential in my fitness arsenal. I throw it in my carry-on luggage when I travel, and toss it in the car when I hit the running track. It’s around $200. The TRX is simple: two handles attached to each end of a strap, with an anchor point in the middle. You attach the anchor point to a stable, high mounting point, and then use the handles to workout. It’s a cousin of men’s gymnastic rings. You can attach it to a tree, monkey bars, a chip up bar in the gym, or the (slightly expensive) mounting options that the TRX folks sell. The TRX is cool because it replaces a variety of other workout gear. You can use it to exercise your chest, back, abs, arms, and much more — it’s a fine alternative to dumbbells, barbells, and the variety of machines in your gym. The bonus is it’s also unstable in a good way — you need to work more muscles to carry out many of the exercises, and so even the humble pushup becomes more of an abs and shoulder stabilization exercise. The video that’s embedded below shows you fifty exercises you can do — it illustrates the amazing versatility, even if a few of the exercises aren’t to my liking. When I was in high school, my record number of chin ups was (maybe) three. They’re a lifelong nemesis. But me being me, I like a challenge — so what’s better than installing a chin up bar in your garage, and getting after improving? I’ve tried a few, and the stud bar pullup bar is the standout winner at $140. It’s sturdy, reasonably easy to install, and easily mounted far from walls. The stud bar pull up bar. It attaches sturdily to the studs in your roof, giving you plenty of clearance from walls. Chin up bars aren’t just for chins ups, and they don’t just work your lats (the muscles under your armpits). With a forward grip, you sure do work your lats, but you also work your core muscles and more. With a reverse grip, your biceps come into play. And there’s lots of great abs exercises you can do by hanging from the bar, and lifting, raising, or rotating your knees. If you want a strong core, it’s a great investment. Resistance bands are rubber bands with (usually) handles at each end. Similarly to the TRX, they’re a versatile way of working muscles in a way that doesn’t require iron. They’re almost as portable as the TRX — easy to throw in a bag when you’re travelling. My favorites are from bodylastics.com. For $36, you can buy their entry-level set — and, honestly, I wouldn’t but their more expensive ones (unless you’re super strong, or you want to work out with a partner frequently). The idea is fairly simple: pull the handle, stretch the band, work one or more muscles. For example, you can wrap a band around a pole, and pull the handles on each end toward your hips to work your back muscles. The bodylastics products come with a nice booklet that illustrates tens of exercises, and has a few suggested routines for those interested in different sports and with different levels of experience. YouTube is also full of resistance band workouts. An agility ladder is a set of plastic straps that are held together on either side by a rope or strap to make a ladder-like apparatus. You lay it out on a floor or path, and then run through it in a variety of different ways; indeed, “run” is a gross generalization, there’s tens of complicated ways to traverse the length of the ladder, many involving complex aerobics-like moves. The benefit is a cardio, brain, and agility workout — you work up a sweat while also teaching your body how to react, accelerate, and move in patterns. They’re incredibly portable, they stow away in a small bag that’s easily thrown into your luggage. I’ve got a list in my head of around thirty different moves I do with an agility ladder — I do each one up and back, catch my breath, and hit the next. It’s a buzz, and doubly-so if you’ve got headphones, music that you can keep pace with, and you’re in the mood to push yourself. I’m disappointed I couldn’t squeeze in my iPod, jump rope, medicine ball, Bowflex 1090 dumbbells, or some humble cones. If this post gets more than a few views, I’ll post my top ten someday soon. See you all next week (and apologies for the intermittent posts this month — work is super busy). This entry was posted in fitness and nutrition and tagged agility ladder, chin up bar, fitbit, resistance bands, trx on September 17, 2012 by Hugh E. Williams. The Bing folks launched their new bingiton challenge today. It’s an anonymized (well, almost) taste test of Google versus Bing for queries that you supply. The challenge is to try five queries, and see how often Bing beats Google. My results from the Bing It On challenge. Google 3, Bing 2. You can see what happened for me: Google 3, Bing 2. Bing claims this isn’t typical, I’ll let you try and it see if they’re right; they claim Bing beats Google 2:1 in their tests. Google wins, but not by a huge margin. What’s not fair is that the Bing It On challenge takes the query-completing autosuggest feature out of play, and also Google’s instant search. Personalization also disappears, though that’s not a bad thing. The pages are also incomplete, so you can’t quite use search in the way you might. But, all up, it’s a reasonable way to compare the two. What happens when you try it? 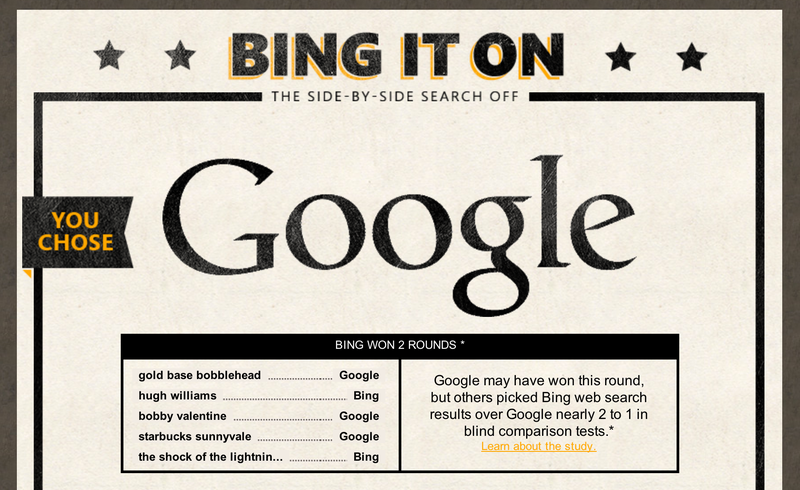 Is it the Google habit for you, or are you thinking about a switch to Bing? This entry was posted in search engines, technology and tagged bingiton on September 6, 2012 by Hugh E. Williams.